Since I write a German food blog in English I get many recipe requests from people who have German ancestors or relatives but do not live in Germany. It’s always very interesting to read about their motivation to recreate a certain dish. They sometimes tell me about their family members who made those dishes but never passed on the recipe. Often I have never heard about their version of a certain recipe. It’s fascinating how traditional German dishes or foods have changed through adaption, other ingredients, and preparation methods. For example pretzels. The first time I heard about the US tradition to serve pretzels with mustard I thought it was super weird. In Germany sausages like bratwurst are served with mustard. But definitely not pretzels. Pretzels are served with butter. The pretzel and mustard combination was invented, so I read, in Philadelphia where soft pretzels became popular in the 19th century. Another thing I found very interesting is the fact that the German pretzel always refers to the shape of the baked good. A pretzel has to be pretzel shaped. In Northern America the name pretzel isn’t always linked to the shape though. Instead, it seems to me, the name refers to the preparation method of baked goods brushed with lye. Everything that is brushed with lye and has the distinctive dark brown colour is called a pretzel, no matter which shape. Another example is “German” potato salad. What most people in the US call a “German” potato salad is not the German potato salad I was used to during my childhood. It’s a recipe popular in the South of Germany but not in the North, where I come from. In the North we often make our potato salad with mayonnaise and not with vinegar. Whenever we would eat the potato salad my grandmother used to make (potatoes, mayonnaise, pickles, cold cut pieces, and cooked eggs) my father, who had lived in the South of Germany for a couple of years when he was a kid, would tell us about how people in Bavaria made their potato salad. And we kids were disgusted. How on earth could you use vinegar in your potato salad? And how could you even eat a potato salad without mayo? That just wasn’t possible! These are just two examples about how foods and traditions change and it’s an interesting topic, I think. Especially when you think about it from a vegan perspective. Since we don’t eat many traditional ingredients like eggs, cheese, or meat, we change food traditions all the time and invent new ones. We don’t eat cheese or bacon and still call some of our foods that. And like I would argue that you cannot call something that is not pretzel shaped a pretzel, meat eaters would argue that you cannot call a smoked eggplant strip bacon. And they would find it weird to pour a liquid made from soy beans over their cereal just like I would find it super weird to brush my pretzel with mustard or add vinegar to my potato salad. It’s tradition, it’s convention, it’s what you are used to. But sometimes traditions or habits change. Maybe you don’t know the tradition. Maybe you don’t care. Maybe you cannot recreate a certain dish because you don’t have access to special ingredients.Or, as in our vegan case, you don’t want to use them for ethical reasons. And so your view on what makes a traditional food will change or you might think: “Who cares when I use different ingredients or make this into another shape? And who cares when I call my eggplant bacon?” Because in the end it’s a creative process and maybe you started a new tradition. And most definitely you created something delicious no matter how you will call it or how you changed certain preparation methods or ingredients. This is how I changed my opinion on käsespätzle (cheese spaetzle). I have been asked so many times to make them vegan and always refused. Because I thought that you just couldn’t veganise them. A vegan käsespätzle dish would always lack one important original ingredient: cheese. 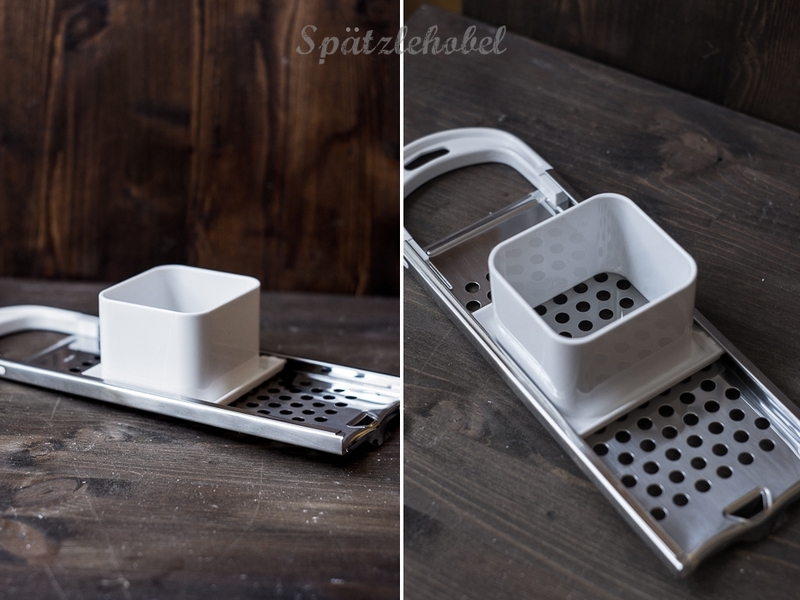 You cannot make käsespätzle without proper cheese. Yes, that’s what I always thought. And it may still be true because it mostly depends on the vegan cheeses you have access to. If you think your cheese tastes good and it melts, then you can go ahead and make käsespätzle. Oh, wait. No you can’t. Because traditional spaetzle can only be made with eggs and you need really good spaetzle scraping skills or it just won’t work. Because traditional spaetzle are made by scraping the wet dough off a wodden chopping board into hot water. But since we don’t own these skills and since we are vegan and don’t use those eggs anyway, let’sjust go ahead and make some eggless spaetzle casserole that we will call cheesy spaetzle casserole even if there’s no cheese inside. No cheese spaetzle. Just vegan mac and cheese made with eggless flour dumplings instead of macaroni. It’s a creamy, savoury, and filling casserole that gets it’s special twist from 1/4 cup of hazelnut butter. If you still want to make cheese spaetzle, skip to the end of this post. Making spaetzle is easy if you have the right tools. You can use a potato ricer to press the dough into the boiling water. Or you can use a tool that is called spätzlehobel in German. (In English this is called a spaetzle maker.) That is what I used. If you use a spaetzle maker like this, your spaetzle will come out short and look similar to little knobs. That’s why these are called knöpfle (little buttons) in German. 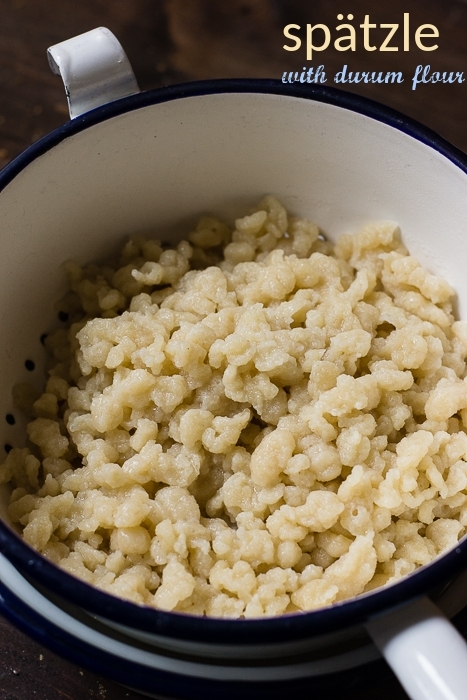 Spaetzle made with the traditional scraping method or with a potato ricer will be not as chubby. 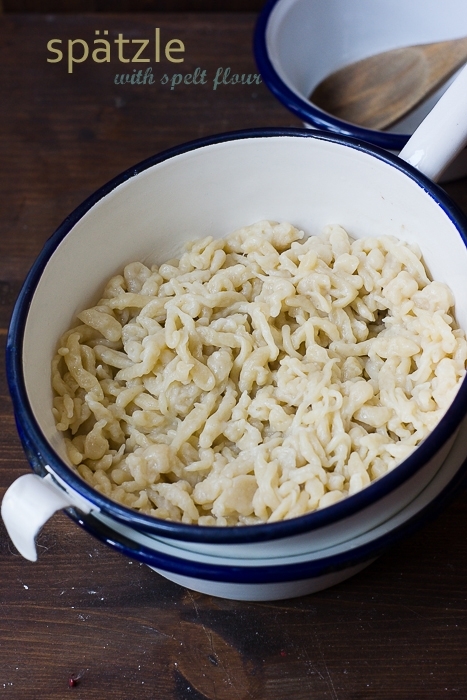 If you make eggless spaetzle there’s a great trick to give you good results. Replace some of the flour with durum flour. It will improve the texture and your spaetzle will cook easier. When I made my first spaetzle version, I used only flour and my dumplings came out very uneven in shape and they weren’t cooked properly: Some of these were also longer and more spaetzle shaped because the dough was wetter. The durum flour definitely absorbs a lot more water than the spelt flour. I will give you both recipes, but I’d go for the one with durum flour. If you don’t have durum flour, you can use a bit of chickpea flour for binding. Maybe it’s a good idea to reduce the the water to 3/4 cup for a firmer batter. 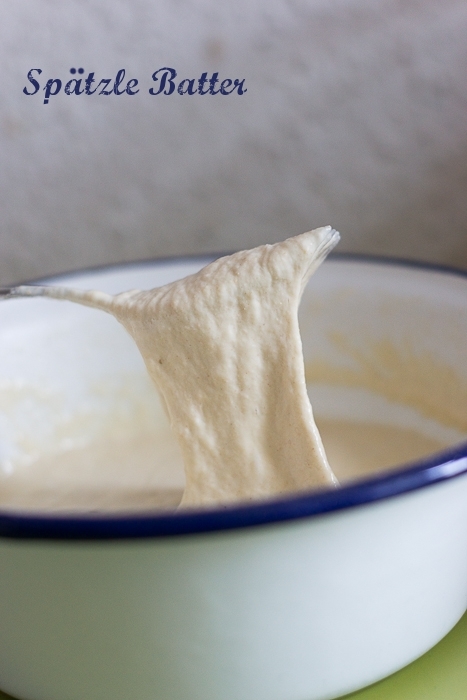 Use a wooden spoon to stir the batter until smooth. Pour about two litres (8 cups) of salted water into a large pot. Add 1 tablespoon of olive oil right before you start to press the dumplings into the water. 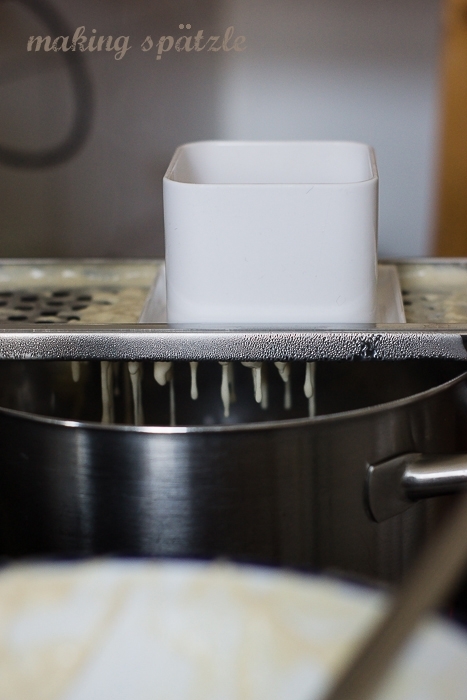 Place your spaetzle maker on top of the pot and pour about half of the batter into the sliding box. Slide it from side to side so that the spaetzle will fall into the water. Repeat with the remaining batter. After one or two minutes the dumplings will float to the top and you can transfer them to a colander. Have a baking dish ready and preheat the oven to 200°C (400°F). Place all ingredients for the sauce in a blender and blend until smooth. Place the spaetzle in the dish and pour sauce on top. Transfer to oven and bake for 30 minutes. Let sit for ten minutes and serve. For cheese spaetzle you just need to place half of the spaetzle in a baking dish and grate a generous portion of your favourite meltable vegan cheese on top. Repeat with the remaining spaetzle and cheese. Top with caramelised onions and bake at 200°C (400°F) until the cheese has melted. Serve. Thank you for sharing this! I’m a vegan cooking coach in Buenos Aires. Today I had a class and shared it with 45 people! They all loved it! It was presented along with a vegan mushroom goulash and it was a success. Thanks a lot, again, for the time and effort you put in your website! Thank you! That makes me very happy to hear! Our family loves spaetzle. Missed it since going vegan 4 years ago. But I just got a spaetzle maker and found your recipe. Tried a double amount tonight. Delicious. Thank you. Family loved them. Any other ideas? Thank you so very much!!!! I love my vegan options….it truly isn’t about what I can’t eat, but just trying to narrow it down from all the magnificent foods there are to eat, to something reasonable. Sauerbraten Tempeh sounds really interesting! I have never had sauerbraten before, do you have a recipe? That’s funny. Apparently many traditions we have in our family are also done “the wrong way”. Although I really wonder if one can say that. I mean I get that people feel very partial to their way of doing things but in the end it’s all just a variation and makes things more interesting, I think. More filling sounds great! I’ve been looking for a decent spaetzle recipe forever, thank you for this! Ich hab mich letztens beim Knöpfle machen gefragt, wie das eigentlich vegan geht. Jetzt weiß ich. :D Statt Durummehl würde ich wohl auch Hartweizengrieß nehmen. Durummehl gibt es aber mitunter in gut sortierten Bioläden. Wenn ich das nächste Mal veganen Besuch habe, probier ich die Spätzle mal aus. Das habe ich aus Dänemark mitgebracht. Man kann in Deutschland online bei verschiedenen Mühlen bzw. beim Bäckereiversand kaufen. Hartweizengrieß könnte aber auch funktionieren. For some reason, I was led to believe that a sour cream and onion dressing was traditional for German potato salad! No, but it sounds very tasty! I love your comments on differences in food tradition from a German perspective. Whenever my Oma talks about something she does in the kitchen she’ll say “That’s how Germans do it!”. Like making potato salad with vinegar, pickles, eggs and (blech) bacon or Cucumber Salad with GERMAN vinegar and dill. Sometimes she’ll just say “That’s how we do it in Europe!! !” which I particularly love. You can’t convince her that not all Europeans eat Poppy Seed Cake. But this is one thing I love about her, and I see the same behavior in myself. When I lived in California I frequently said “This is what we do in TEXAS!! !” knowing full well that Texas is huge with a vast array of preferences and traditions. But the proclamations made me feel closer to what I love about Texas just as I’m sure my Oma’s proclamations make her feel closer to her homeland. Love your perspective on tradition and creativity Mihl. People get so attached to traditions but I’d like to think I put my ethics before simply eating something because that’s “what we’ve always done”. We can definitely create new vegan traditions to get attached to instead! 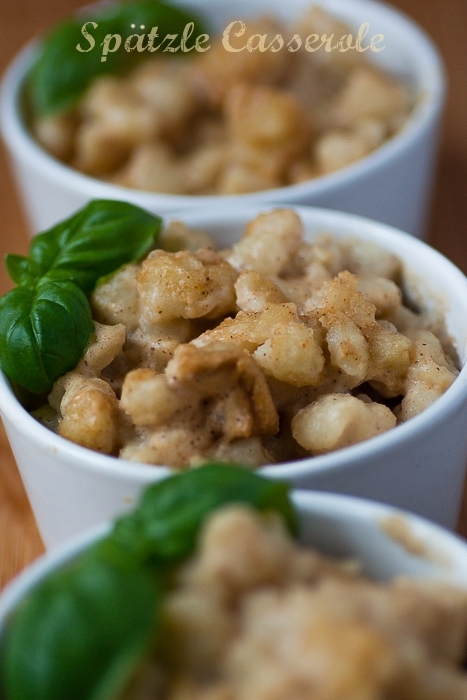 These spaetzle look amazing! I tried a spaetzle dish in Austria I think it was, many years ago pre-vegan. I bet your cheesy sauce is great on regular pasta or potatoes too. Thanks for this. Though I was raised by a German mother, my father was of Irish descent, and my German grandmother died when I was only 5, so we did not see traditional German food much. I hadn’t heard of this particular dish. It’s nice to know about potato salad. My mother always used mayo, never vinegar. Worth trying – although I usually just cheat and just buy the dm/alnatura Spaetzle when in Germany ;) You can’t believe how sick I am as a German in the UK to hear how people love Pretzel, Weißwurst and other southern/Bavarian food, when I was pretty much raised on fish, beetroot and dill by a northern family with East Prussian roots. The food of southern Germany is more foreign to me than any “foreign” food, I’ve always felt. The dm shops in Dresden don’t carry those anymore but thankfully I found some at the health food store. And I totally feel the same when it comes to Southern German food. <3 Although I love pretzels. Ah, super, ich habe mich schon lange mal wieder an vegane Spätzle wagen wollen, nachdem mein Versuch letztes Mal nur einen grauslichen Brei produziert hat. Allerdings mache ich dazu lieber saure Linsen (traditionell würde man die mit Kutteln essen, aber die lasse ich gerne weg) als sie zu überbacken. Champignon-Sauce oder *geschnetzeltes in Pilzrahm geht auch immer gut dazu. Pilzrahm hört sich gut an! Und was den Kartoffelsalat angeht: mit der Version Deiner Oma kann ich mich anfreunden. Hauptsache Mayo!